Price et al (2015) have recently published a paper in PNAS in which they report that Cas9 can be used as a RNA-targeting system. Clustered, regularly interspersed, short palindromic repeats-CRISPR associated (CRISPR-Cas) systems are a diverse collection of adaptive immune systems found in prokaryotes that are being employed in multiple ways to modify genomes and regulate gene expression. CRISPR-Cas9 from Streptococcus pyogenes is the main platform in use currently and has well known characteristics of associating with and cleaving DNA, forming the basis for many new technologies. Recently SpCas9 was shown to cleave RNA in vitro and this seemed to foreshadow an expansion of the CRISPR-Cas9 platform. Price et al. describe their work with Cas9 from Francisella novicida (FnCas9) and its ability to interact with the genome of hepatitis C virus, a +ssRNA virus, in a human hepatocyte cell line. They report a number of observations. They constructed an RNA-targeting guide RNA (rgRNA) and found that inhibition of HCV (the ‘output’ of their assays) was PAM-sequence independent. Also, while there are critical sequences in the 3′ end of sgRNAs designed against DNA targets, those sequences were not critical for the action of FnCas9 against HCV. Instead, sequences in the 5′ end of the targeting sequence were critical. Mutations in active-site domains involved in DNA cleavage did not eliminate inhibition of HCV by FnCas9. Price et al also found that RNA-targeted FnCas9 could directly inhibited translation and virus replication. If FnCas9 was directed to the nucleus by the inclusion of a nuclear localization signal, inhibition of HCV was greatly reduced. Not unexpected, since HCV is confined to the cytoplasm but the significance of this is that cytoplasmic restriction of Cas9 would reduce ‘off target’ effects on nuclear DNA. The ability of FnCas9 to associate with RNA was not unique among Cas9 proteins and Price et al. 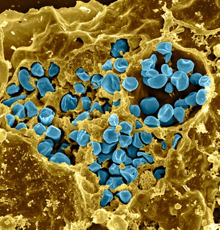 found the type II Cas9 proteins from Streptococcus pyogenes, S. thermophils and Neisseria meningitidis equally capable of associating with and inhibiting HCV in vivo. More can be expected on RNA-targeted CRISPR-Cas systems in the near future and there is no doubt these technology platforms and applications will be readily transferred to insect systems, giving insect biologist an ever growing list of genome modification and manipulation options based on CRISPR-Cas9.